Objective: The sacroiliac joint (SIJ) can become dysfunctional through trauma and/ or pregnancy. The mechanism involves direct or repetitive microtrauma to the buttocks/ lower back. Treatment with specialised physiotherapy alleviates the problems in ~ 80% of cases. The remainder may respond to prolotherapy (hypertonic glucose injections into the dorsal intra-osseous ligament (DIOL) after multiple injections. We hypothesised that the response may be more rapid with injection of platelet enriched plasma (PRP) into the DIOL under ultrasound guidance. Design: Following Ethics approval, a study was undertaken to compare the efficacy of PRP injections Vs Standard prolotherapy. Setting: A group of 45 patients (35F, 10M, Age range:18-70 yrs) was studied and the results compared to the control group who had received hypertonic glucose injections following tertiary referral from specialized sports medicine physicians. 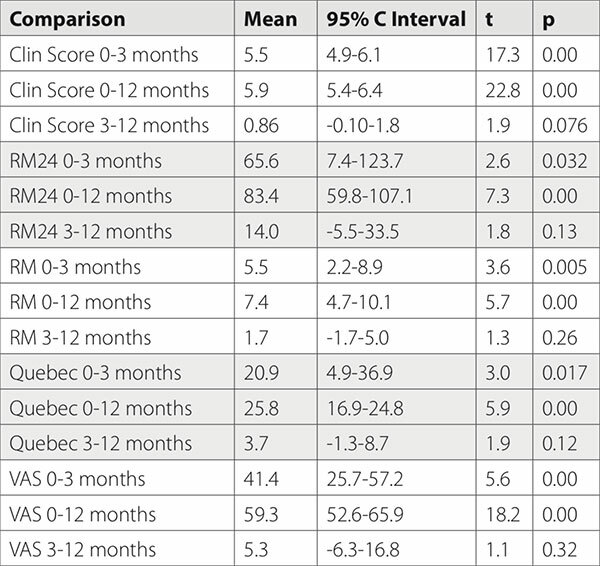 Main outcome measures: All patients were assessed clinically at baseline, 3 and 12 months. Outcome measures included VAS, Roland-Morris questionnaire and Quebec Back Pain inventory, as well as clinical tests of SIJ incompetence. Results: The outcome measures of change in pain scores, improvement in function between the groups was superior for the PRP group, All PRP patients experiencing significant improvement in pain score and function. The number of injections required was less for the PRP group (mean of 1.6) than the controls (mean 3.0). Conclusion: PRP is a viable alternative to hypertonic dextrose injections into the DIOL in patients who have failed physiotherapy for SIJ incompetence. It is better tolerated as less injections are required and avoids radiation exposure in a relatively young group of patients. The northern European literature is replete with numerous publications that report the sacroiliac joint (SIJ) as a major cause of lateralising lower back pain, particularly in the postpartum period (pelvic girdle pain syndrome).5-16 These studies indicate that dysfunction of the sacroiliac joint may account for up to 20% of low back pain in the peri-partum population. Others have reported a significant incidence of traumatic dysfunction of the sacroiliac joint and coined the term sacroiliac joint incompetence to include both trauma and the postpartum variant.17 The evidential basis for the diagnosis are the European guidelines for the diagnosis and treatment of pelvic girdle pain.18 The basis for the treatment is the integrated model of form and force closure of the sacroiliac joint.19 Two aspects characterise the model. (See Figure 1.) Form closure of the sacroiliac joint is due to the interlocking surfaces between the sacrum and the adjacent iliac bones and the stabilising influence of the dorsal interosseous sacroiliac ligaments (DIOL). (See Figure 2.) Force closure is due to the sequential contraction of the abdominal core muscles which lock the sacrum into the pelvic ring. Loss of the sequential contractility is a response to abnormal mechanics, where the sacrum counter-nutates or rotates out of the pelvic ring when the DIOL is damaged, triggering disadvantageous muscle activity (spasm) with resultant loss of force closure. Figure 1. Form and Force closure of the sacroiliac joint. Panel A. Form closure is due to the fit of the irregular surfaces of the sacrum and iliac bones physically locking the sacrum into the pelvic ring (arrows) between the two iliac bones. The posterior integrity of the joint is maintained by the dorsal interosseous ligament. Panel B. Force closure is the compressive effect exerted on the pelvic ring by the co-ordinated contraction of the abdominopelvic muscles which shut the sacrum between the iliac bones and stops it rotating outward. Figure 2. Dorsal interosseous ligament (DIOL). The deep and superficial parts of the DIOL fill in and stabilise the posterior aspect of the sacroiliac joint to form the syndesmotic part of the joint. The fibres cross the joint in a variety of orientations to maximise stability. It is considered the strongest ligament in the body, as it has to bear the weight of the thorax, neck, upper limbs and head. Inclusion criteria included patients who presented with pain in the lumbo-sacral region who demonstrated 3 of 4 positive validated clinical signs18 and who had failed best practice physiotherapy for a minimum of 3 months. The group included several elite athletes from snow sports (2), football (1), hockey (1), tri-athletics (1), judo (1), surf boat rowing (1), Police SWAT team (2) and pole dancing (1). There was a clear history of discrete trauma to the lower back or buttocks or repetitive trauma such as landing on the same leg after jumping. Exclusion Criteria: age less than 18, and patients who had a history of the following: prior pelvic fractures, pregnancy, platelet deficiency, inflammatory conditions, and neoplastic disease. All patients gave informed written consent following ethics approval from the University of Notre Dame in Sydney (Ethics PP : 015002S) and the study was registered as a clinical trial with the Australian and New Zealand Trial Registry (ANZ TR 368092). 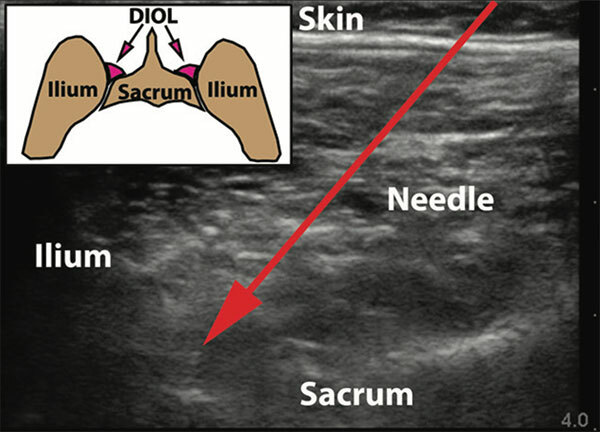 The ultrasound injection technique was adapted from the work of Hartung et al.24 Our group however targeted the injection into and around the dorsal interosseous ligament (DIOL) rather than the synovial portion of the sacroiliac joint. This technique has been described in detail previously.25 A Sonosite Edge ultrasound machine (Fujifilm Sonosite, Washington, USA) was utilised with a 5-16 MHz linear probe. of the sacral segments are then palpated and marked and the ultrasound transducer is placed in a transverse orientation at approximately the S2 segment. Figure 4. 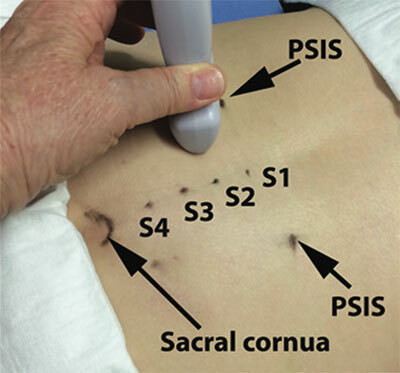 The ultrasound probe positioning technique in Figure 3 yields images of the iliac bone and sacrum at the S2 segmental level at the lateral edge of the sacrum. The needle path is angulated at approximately 45 degrees to the vertical towards the gap between the iliac bone and the sacrum to reach the dorsal interosseous ligament as shown in the inset anatomical drawing (arrows) in a transverse orientation. An initial skin injection along the track of the eventual injection was performed using Lignocaine 1% without entry into the DIOL. This initial track was then followed when performing the therapeutic injection of the PRP solution into the DIOL of the SIJ. Figure 5. Pain maps. The summed pain maps shows the typical distribution of pain in the group of patients studied, with localisation of pain to the lower back, buttock, lateral thigh and into the ipsilateral inguinal region. 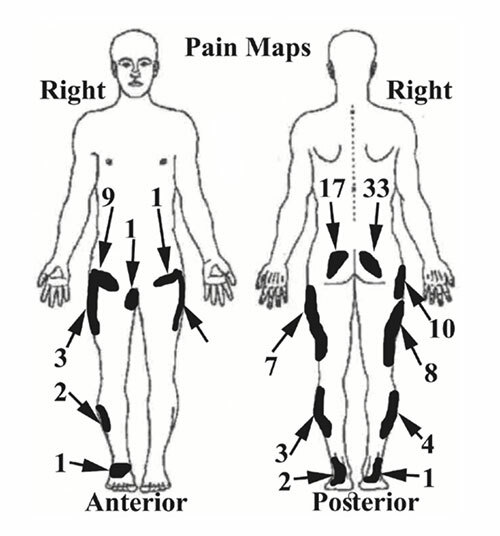 The pain maps following introduction of the needle into the DIOL at the time of PRP injection were identical to the maps produced at the time of the initial clinical examination. The distribution validates the term “pseudo-sciatica”. Injections were performed as a single injection per visit with the second injection being 6 weeks to 3 months later depending on the clinical follow-up. These results were compared to a group of patients treated with prolotherapy (hypertonic glucose) with equivalent follow-up and reported elsewhere.20 Briefly, patients were treated with a single injection per visit with the remainder being administered as single injections approximately 3 months apart depending on the response at follow-up visits. All injections were administered into the DIOL under CT guidance. A total of 48 patients were recruited into the study but 3 patients dropped out after the first injection, leaving 45 patients with complete follow-up. This was comprised of 35 females (Mean age: 38.7 years) and 10 males (Mean age: 33.4) with an overall age range of 18-70 years. Patients identified the peri-partum period, trauma to the buttocks/lower back or repetitive injury as the main associations with the onset of lateralising lower back pain and indicated the distribution of their pain on a baseline pain map. (See Figure 5.) The average length of symptoms was 46 months with a median of 57 months. 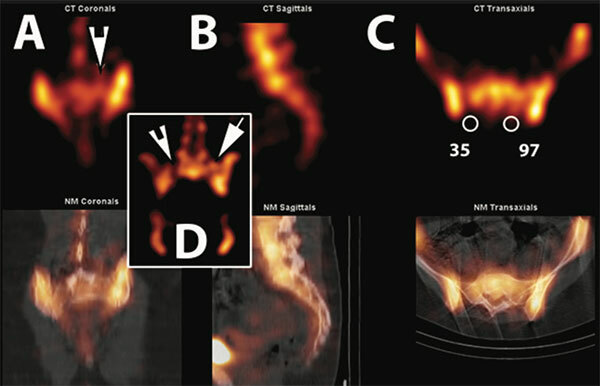 Clinical findings met criteria defined in the European guidelines18 and confirmed by the fused single photon emission computed tomography (SPECT) and low-dose x-ray computed tomography (CT) in all patients.17 Sample images are illustrated in Figure 6, showing uptake of tracer in the damaged target ligament (DIOL). Figure 6. SPECT/ CT image of the pelvis. The nuclear medicine bone scan SPECT image shows increased soft-tissue uptake of the isotope in the damaged left DIOL(arrowhead) and left SIJ in panel A. The region of interest over the ligament soft-tissue uptake in panel C shows a relatively higher count profile (97 counts) in the circular region of interest than on the normal right side (35). Fused images in the lower panel confirm the location of the scintigraphic abnormalities in the CT study. 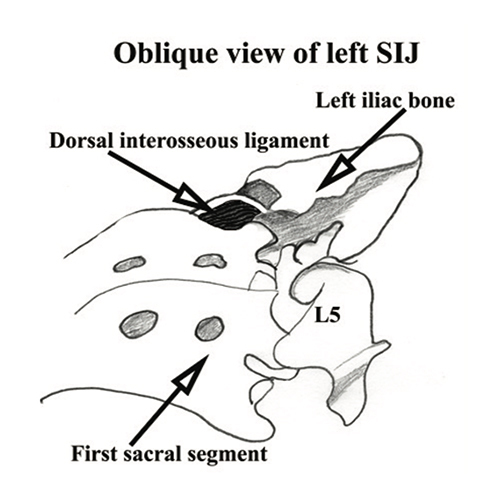 The inset image (panel D) shows that the dorsal space of the SIJ where the DIOL is located, accumulates the isotope in the damaged ligament (arrow) on the left, and the undamaged ligament shows no evidence of uptake, with a channel of absent counts (arrowhead). The patients that dropped out of the study (n=3) were due to breast cancer requiring surgery, chemotherapy and radiation. The second developed a painful ovarian condition with pelvic pain that made assessment of the SIJ condition impossible and the third moved overseas. When compared to the 25 patients who historically underwent prolotherapy20 there was no significant difference in the clinical scores 7.2 versus 7.7, mean age (40.4 versus 38.7) or length of history (48 versus 46 months). The baseline pain maps were not significantly different to the pain reproduced at the time of PRP injection and are shown in Figure 5. Pain extended from the ipsilateral buttock and wound around the lateral upper thigh and into the ipsilateral inguinal region. An average of 1.6 injections was administered to each patient (Median 2.0 and range 1-3). There were no complications during or after the PRP injections. Baseline score for the clinical examination was 7.7, RM24 93.4, RM 9.2, Quebec 31.8 and VAS 63.1. All patients experienced good pain control and functional improvement at 3 months after the PRP injections were completed. The changes in scores after injection for the variables are shown in Table 1. Significant improvement in clinical and pain scores and performance indicators occurred at 3 months after the injections without further improvement between 3 and 12 month across all scoring systems. There are fundamentally two methods for achieving stability of the sacroiliac joint. Surgical fusion is the extreme solution29 which is rarely required. Other less invasive techniques include prolotherapy or the current method of PRP injection. The injection of hypertonic glucose frequently referred to as prolotherapy promotes an inflammatory response in the tissues. This attracts platelets and growth factors and promotes the activity of fibroblasts. The healing process has three overlapping phases, commencing with an inflammatory phase that lasts approximately 2-3 days followed by a repair phase that may last up to 6 weeks with subsequent remodelling that may take a further 2 to 3 months.30,31 PRP has the advantage of delivering more platelets to the region and therefore more growth factors to promote the healing response.32 The original method of preparing PRP is by taking 6.0 mls of blood into a plain blood collecting tube with an anticoagulant. The tube is spun for 20 minutes and the “buffy coat” removed. This has a large margin for error when removing the buffy coat and some of the red blood cells, granulocytes and cells other than platelets can be harvested. There are many commercial preparation systems available and these have varying cell counts and can concentrate platelets in differing amounts.23,31 Current research indicates that differing cell-counts are required for different purposes.31 For example joint injections require 4-5 times the platelets than ligament injections for a response.33 The Regen preparation has no red blood cells, which can be deleterious to the repair and also captures the granulocytes which can be catabolic. More importantly, newer research again is showing that the harvest of growth factors is higher in the Regen system than some of the systems that capture 4-5 x baseline platelet counts.34 The singular problem is that systems which currently capture 4-5 x baseline platelet counts also capture significantly more red cells. Regen System (RegenLab Le Mont-sur-Lausanne, Switzerland) was chosen for its cell profile count, small amount of blood required (9ml) and centrifugation at 3500 rpm for only 5 minutes. The current study shows a significant improvement in the clinical and functional status of patients treated with PRP over the prolotherapy group. This may also reflect the significantly higher baseline functional impairment in the prolotherapy group, although the clinical scores were not significantly different (7.2 for the prolotherapy group versus 7.7 for the PRP group). This data is presented in Table 2. The other advantage of PRP was the use of a mean of 1.6 injections versus 3.0 for the prolotherapy injections. Furthermore, there was no radiation exposure to the patients as opposed to the prolotherapy injection which was done under CT guidance. Table 2. 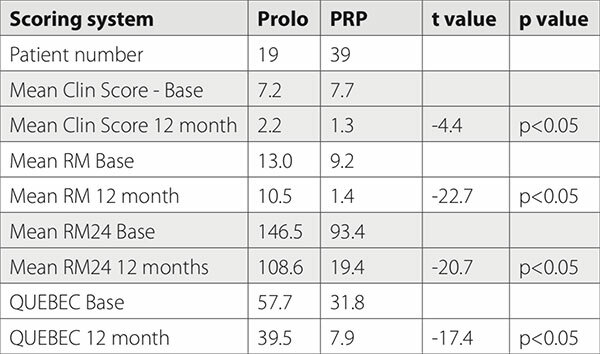 Comparison of Prolotherapy and PRP at 12 months. Two other groups have reported good clinical and functional outcomes in patients with mechanical dysfunction of the sacroiliac joint with the use of PRP injections.35,36 A salient difference between these reports and the current study is that we specifically targeted the injection into the DIOL and not the sacroiliac joint as was undertaken in the two previous reports. Furthermore, one study had only 4 patients, although follow-up was for 48 months.35 The other study36 randomised 40 patients for injection with PRP or methylprednisolone into the SIJ under ultrasound guidance. They found a 90% improvement at 3 months in the PRP group compared to 25% improvement in the steroid arm of the study after 3 months follow-up. The site of injection is crucially important to the clinical outcome. Murakami et al.37 undertook a study in 50 patients with mechanical dysfunction of the SIJ established by pain provocation manoeuvres. There were 25 patients in each arm of the study who had either intra-articular or peri-articular injection of lignocaine 2%. Peri-articular injections resulted in abolition of pain in all 25 patients, but the intra-articular injections resulted in abolition of pain in only 9 of 25 patients. Cross-over of the remaining 16 to peri-articular injection resulted in complete abolition of pain in all patients. It confirms that the principal site of pain-generation is not the joint, but the surrounding ligamentous tissue, as confirmed by the pain-maps generated by entry of the needle into the DIOL in the current study. Furthermore SPECT/ CT of the bone scan also shows significantly higher uptake of the bone scanning agent in the DIOL of the symptomatic SIJ17, suggesting chronic injury to the ligament with a calcific response, as the ligament is a relatively avascular structure, not associated with the synovial portion of the sacroiliac joint.35 It may also explain the failure to visualise the ligament injury by MRI as there is no oedematous (ie. water) response. The vast body of critical literature on both prolotherapy34 and PRP injection to treat various sources of musculoskeletal pain syndromes shows minimal clear-cut evidence of utility. A recent review of PRP in treatment of soft-tissue injury found that the Cochrane review of 2014 that contained 19 randomised trials and a further 10 trials since then showed insufficient evidence to support its utility.30 A major issue raised in review of these trials was that the PRP content and quality varied widely and probably affected effectiveness. This was one of the reasons for our choice of a commercially available system from Regen. One of the most disturbing aspects of PRP injection is its routine clinical use and cost in the absence of evidence to its utility and the failure to apply it in properly constructed research trials. Even worse is the failure to define a specific target for the intervention with a measurable outcome related to that target with appropriate long-term follow-up. We found it difficult to randomise the procedure due to the level of intervention involved with drawing blood samples, spinning the samples down and discarding the buffy coat prior to injection. This involved insurmountable objections from the Institutional Ethics Committee and led to the abandonment of the blinding process and adoption of the open label trial with a historical comparator. While not being an ideal circumstance from the trial point of view, we felt it was a valuable addition to the literature as there was a common and troubling disease, a specific target (dorsal interosseous ligament of the sacroiliac joint), reproduction of the patient’s typical pain maps and adequate longitudinal clinical and functional follow-up to minimise the placebo effect. The utility of the technique in the athletic population has two major advantages. Firstly, it offers a diagnostic portal with reproduction of typical symptoms when the needle is introduced into the DIOL. Secondly PRP speeds up the healing process with early stabilisation of the SIJ and has the potential for early deployment in the therapeutic algorithm, as time is a critical issue for elite athletes. Mechanical dysfunction of the sacroiliac joint is a common and poorly recognised condition that may be more prevalent than disc prolapse as a source of lateralising lower back pain. Diagnosis was previously based on a complex series of physical examination tests but has in recent years been confirmed by SPECT/ CT imaging. While 80% of patients improve clinically and functionally with targeted physiotherapy, a significant proportion will require injection therapy with either PRP or prolotherapy to increase the integrity of the dorsal interosseous ligament of the sacroiliac joint. PRP injection under ultrasound guidance can improve function and reduce chronic pain in a high proportion of these patients with little risk or complication. The authors involved in this study have no conflict of interest. Ehrlich GE. Low back pain. Bull World Health Organ. 2003;81:671-676. Atkinson L, et al. Surgical management of low back pain. Med J Aust. 2016; 204:299-300. DePalma MJ, et al. What is the source of chronic low back pain and does age play a role? Pain Med. 2011;12:224-233. Andersson G. Epidemiological features of chronic lower back pain. Lancet. 1999;354:581-585. Albert H, et al. Incidence of four syndromes of pregnancy-related pelvic joint pain. Spine. 2002;27:2831-2834. Cook C, et al. Interrater reliability and diagnostic accuracy of pelvic girdle pain classification. J Manipulative Physiol Ther. 2007;30:252-258.
de Groot M, et al. The active straight leg raising test (ASLR) in pregnant women: differences in muscle activity and force between patients and healthy subjects. Man Ther. 2008;13:68-74. Dreyfuss P, et al. Sacroiliac joint pain. Journal of the American Academy of Orthopedic Surgery. 2004;12:255-265. Hainline B. Low-back pain in pregnancy. Adv Neurol. 1994;64:65-76. Hansen A, et al. Postpartum pelvic pain—the “pelvic joint syndrome”: a follow-up study with special reference to diagnostic methods. Acta Obstet Gynecol Scand. 2005;84:170-176. Laslett M. Evidence-based diagnosis and treatment of the painful sacroiliac joint. J Man Manip Ther. 2008; 6:142-152. Mens JMA, et al. The active straight leg raising test and mobility of the pelvic joints. European Spine Journal. 1999;8:468-473. Ostgaard HC, et al. Prevalence of back pain in pregnancy. Spine. 1991;549-552. Svensson HO, et al. The relationship of low-back pain to pregnancy and gynecologic factors. Spine. 1990;15:371-375.
van Kessel-Cobelens AM, et al. Pregnancy-related pelvic girdle pain: intertester reliability of 3 tests to determine asymmetric mobility of the sacro-iliac joints. Journal of Manipulative Physiotherapy. 2008;31:130-136. Vleeming A, et al. Possible role of the long dorsal sacroiliac ligament in women with peripartum pelvic pain. Acta Obstet Gynecol Scand. 2002;81:430-436. Cusi M, et al. Metabolic disturbances identified by SPECT-CT in patients with a clinical diagnosis of sacroiliac joint incompetence. Eur Spine J. 2013;22:1674-1682. Vleeming A, et al. European guidelines for the diagnosis and treatment of pelvic girdle pain. Eur Spine J. 2008;17:794-819. Lee DG, et al. An integrated therapeutic approach to the treatment of pelvic girdle pain. In: Vleeming A, et al. eds. Movement, stability & lumbopelvic pain. London: Elsevier, 2007:621. Cusi M, et al. The use of prolotherapy in the sacroiliac joint. Br J Sports Med. 2010;44:100-104. Zaidi HA, et al. Surgical and clinical efficacy of sacroiliac joint fusion: a systematic review of the literature. J Neurosurg Spine. 2015;23:59-66. Eppley B, et al. Platelet quantification and growth factor analysis from platelet-rich plasma: implications for wound healing. Plast Reconstr Surg. 2004;114:1502-1508. Wasterlain A, et al. Contents and formulations of platelet-rich plasma. Oper Tech Orthop. 2012; 22:33-42. Hartung W, et al. Ultrasound-guided sacroiliac joint injection in patients with established sacroiliitis: precise IA injection verified by MRI scanning does not predict clinical outcome. Rheumatology (Oxford). 2010;49:1479-1482. Saunders J, et al. An exploration of ultrasound-guided therapeutic injection of the dorsal interosseous ligaments of the sacroiliac joint for mechanical dysfunction of the joint. JSM Pain Manag. 2016;1:1003-1007. Ercin E, et al. History, clinical findings, magnetic resonance imaging, and arthroscopic correlation in meniscal lesions. Knee Surg Sports Traumatol Arthrosc. 2012;20:851-856. Puhakka KB, et al. MR imaging of the normal sacroiliac joint with correlation to histology. Skeletal radiology. 2004;33:15-28. Ikeda R. Innervation of the sacroiliac joint. Macroscopical and histological studies. Nihon Ika Daigaku Zasshi. 1991;58:587-596. Buchowski JM, et al. Functional and radiographic outcome of sacroiliac arthrodesis for the disorders of the sacroiliac joint. Spine J. 2005;5:520-528; discussion 529. Dagenais S, et al. Prolotherapy injections for chronic low-back pain. Cochrane Database Syst Rev. 2007:CD004059. Alsousou J, et al. The biology of platelet-rich plasma and its application in trauma and orthopaedic surgery: a review of the literature. J Bone Joint Surg Br. 2009;91:987-996. Wu PI, et al. Platelet-rich plasma. Phys Med Rehabil Clin N Am. 2016;27:825-853. Filardo G, et al. Platelet-rich plasma intra-articular knee injections for the treatment of degenerative cartilage lesions and osteoarthritis. Knee Surg Sports Traumatol Arthrosc. 2011;19:528-535. Mautner K, et al. A call for a standard classification system for future biologic research: the rationale for new PRP nomenclature. PM R. 2015;7:S53-59. Ko GD, et al. Case series of ultrasound-guided platelet-rich plasma injections for sacroiliac joint dysfunction. J Back Musculoskelet Rehabil. 2017;30:363-370. Singla V, et al. Steroid vs. platelet-rich plasma in ultrasound-guided sacroiliac joint injection for chronic low back pain. Pain Pract. 2017;17:782-791. Murakami E, et al. Effect of periarticular and intraarticular lidocaine injections for sacroiliac joint pain: prospective comparative study. J Orthop Sci. 2007;12:274-280.